"Looking for something new? 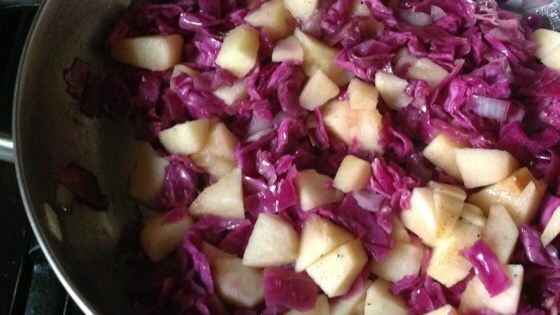 Try this sweet and sour apple and cabbage dish." Heat oil in a medium size saucepan. Stir in cabbage and onion; fry until wilted. Stir in apple and water, salt and pepper. Cover and simmer about 25 minutes. Pour vinegar and sugar into the mixture while tasting for desired sweet and sour taste. Cook another 5 to 6 minutes. This was good both hot and, later, cold. A little sweeter than I cared for. Next time I will increase the vinegar and decrease the sugar, as I like them a little "pickle-y"
This was an easy, quick and really tasty recipe. I substituted 3 strips of bacon in lieu of the oil and also used apple sauce instead of apples. I wish I would have made a double batch! We really enjoyed this different dish. And easy enough to make. I used another reviewers suggestion and used apple cider vinegar (instead of white) and brown sugar (instead of white). I have made this several times and it is wonderful. This time I used bacon drippings instead of the oil and it was better yet! My go-to recipe every time we have pork shoulder roast. Love it.